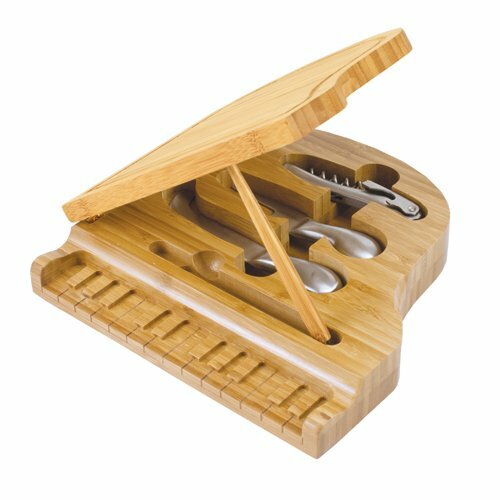 The Piano Cutting Board with Cheese Tools is made of rich bamboo shaped like a baby grand piano complete with engraved keyboard and prop stick to hold the piano lid in place. Prop open the lid to reveal the beautiful brushed stainless steel tools including a corkscrew and two cheese tools (one fork-tipped cheese knife and one cheese fork) and a beautiful brass toned piano hinge. The Piano cheese board and tool set makes a perfect gift for pianists, music enthusiasts, and those who love owning items that are uniquely novel and fun to share with guests. Its brushed stainless steel tools provide the finishing touch to this one-of-a-kind premium entertaining set. The Piano will have your guests talking from the moment they see it!